High population density and restricted evacuation options make cities particularly vulnerable to threats posed by air-borne contaminants released into the atmosphere through industrial accidents or terrorist attacks. In order to issue evacuation or sheltering advice to the public and avoid or mitigate impacts on human health, emergency responders need timely information about expected pollutant pathways, concentration levels and associated human exposure risks. Such information can be derived from atmospheric dispersion models, which are key components of emergency response management systems. Concentration predictions from such models need to be as robust and reliable as possible, while at the same time being available in near real-time. Due to the effect of buildings on local wind fields, the dispersion behaviour in cities is distinctively different from rural areas. Pollutant transport is determined to a large degree by the arrangement of buildings and streets. Effects like pollutant channelling along street canyons, plume branching in intersections or pollutant trapping and mixing in low-speed recirculation zones behind buildings make urban dispersion scenarios particularly complex (Figure 1). High-resolution (approx. 1 m), building-resolving simulation methods can reproduce these effects with a high level of accuracy, but the turnaround time for such model output is currently much too long to be usable in emergency events. Instead, simpler fast-running modelling tools are needed. The EPSRC-funded DIPLOS project (‘Dispersion of Localised Releases in a Street Network’) set out to identify driving urban dispersion mechanisms and to improve their representation in fast emergency-response dispersion models. 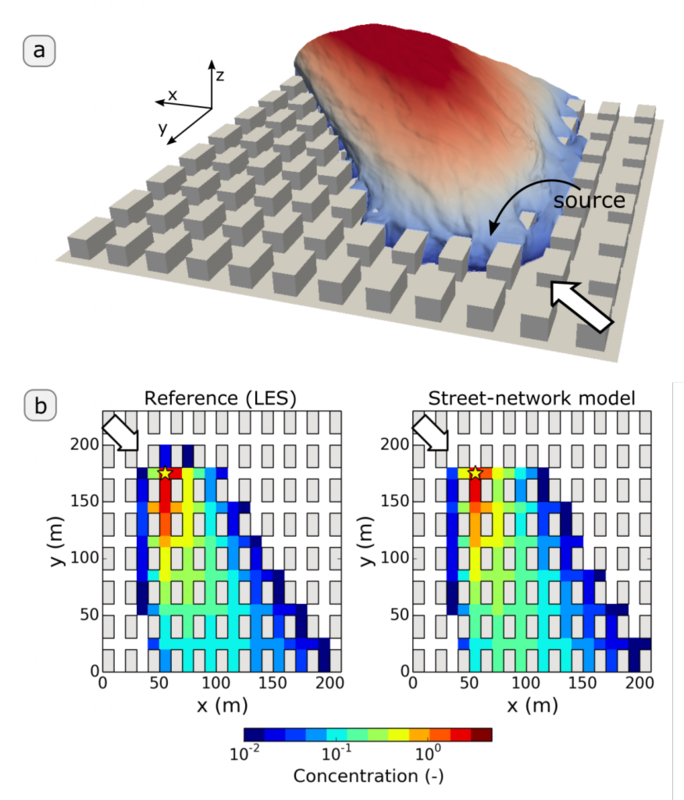 Based on high-resolution simulations and wind-tunnel experiments, representatives of the street-network dispersion modelling class were evaluated in detail. An example of this relatively new approach is the model SIRANE, which is the only street-network dispersion model currently in operational use. Figure 1: Flow streamlines in idealised urban settings studied in DIPLOS. (a) Helical motion through elongated streets and low-speed recirculation zones in sheltered street canyons in a uniform geometry. (b) Flow disturbances created by a tall building: downdraft on the windward side, low-speed recirculating updraft regions on the leeward side. Thick arrows show the ambient wind direction. Models like SIRANE treat urban areas as a network of streets connected at intersections and compute pollutant fluxes through the interfaces between street and intersection volumes (Figure 2). While not resolving buildings explicitly, network models are directly aware of the street layout and thus of possible pollutant pathways. 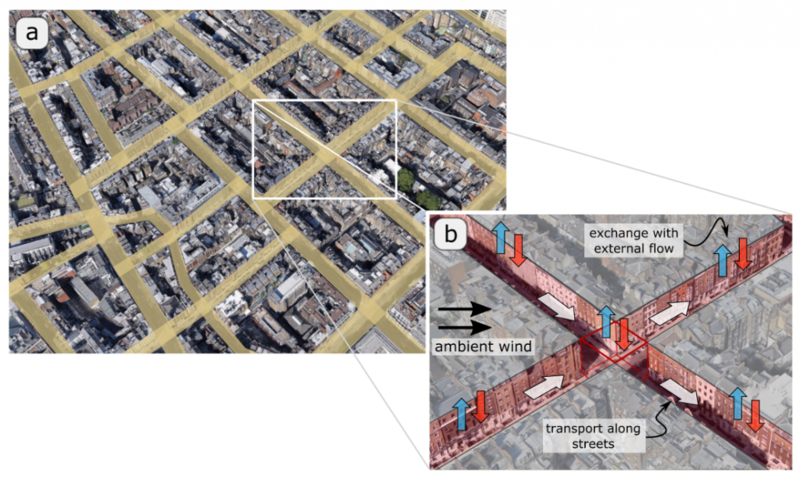 This model feature is crucial as even in simplified urban settings like the ones considered in DIPLOS, the main direction of pollutant transport at pedestrian level can be vastly different from the ambient wind direction because pathways are restricted by the street topology (Figure 3a). Comparisons with high-resolution large-eddy simulations showed that the simple street-network methodology is able to capture this mechanism and also accounts for pollutant exchange with flow above roof-level in a realistic way (Figure 3b). Overall, the comparatively simple street-network models were found to perform as well as more sophisticated stochastic dispersion models while only needing a fraction of the time to run (typically, a few minutes) and minimal wind input information. They outperform analytical Gaussian solutions, which are widely applied for regulatory purposes, but lack any explicit building awareness. Model performance, however, is crucially dependant on the suitable modelling of transport velocities along streets. Further improvements of the network-model performance can be achieved by taking into account the delayed dispersion of pollutants trapped in building wakes, effects of isolated tall buildings and turbulent concentration fluctuations. The work presented here is the result of a collaboration between the Universities of Reading, Southampton and Surrey and the École Centrale de Lyon in France. DIPLOS is coming to an end in August 2017. An overview of the project, researchers and institutions involved and of science output is available on the DIPLOS website. Figure 2: (a) Representation of the topology of streets and intersections in street-network dispersion models. (b) Horizontal transport and vertical exchange mechanisms in network models. Background images from Google Earth. Figure 3: Case of continuous pollutant release at ground-level within an intersection: (a) Plume envelope with colours indicating the plume height. The height of the buildings is H = 10 m (dark red plume areas are at approx. 4.5 H). (b) Street-network model prediction of the mean pollutant concentrations in streets and intersections (right) in comparison to reference results from high-resolution large-eddy simulation (LES; left). Stars mark the location of the source. This entry was posted in Environmental hazards, Numerical modelling, Urban meteorology and tagged DIPLOS, SIRANE. Bookmark the permalink.